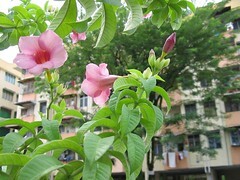 Botanical name: Allamanda blanchetii A. DC. Plant type: Indoor or outdoor flowering shrub or vine. Brief plant info: Prefers full sun, moderate water and well-drained soil. 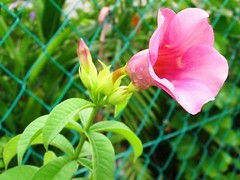 More plant info: Check at TopTropicals. Lovely flowers, though last for a day or two! This shrub will soar skywards, reaching 10-15 feet tall with unattractive leggy stems if not given a heavy haircut occasionally. Be unkind and it’ll be presentable as a beautiful bushy shrub with lots of green leaves and bountiful blooms to delight you! Be aware though that all parts of plant are toxic and its latex can cause skin irritation. Hence, wear gloves when pruning this lovely viny shrub if you’re prone to skin allergies.